With the demise of the Obamacare repeal-and-replace bill, what’s next for health care? With the demise of the American Health Care Act all but rendering health care reform a moribund issue, tax reform likely will present its own challenges for President Trump and Congress, says Richard L. Kaplan, the Peer and Sarah Pedersen Professor of Law at Illinois. 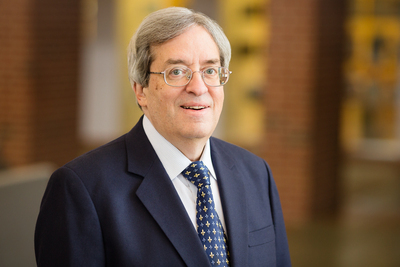 Richard L. Kaplan, the Peer and Sarah Pedersen Professor of Law at Illinois, is an internationally recognized expert on U.S. tax policy and retirement issues. In an interview with News Bureau business and law editor Phil Ciciora, he discusses health care and tax issues after the Republican Party’s failure to repeal and replace the Affordable Care Act, former President Obama's signature health care law. Is health care reform dead for now? It certainly appears to be dead for the next several months, having lost its momentum and priority, but don’t be surprised if the Republicans bring this issue back and spend more time and political capital on another Obamacare replacement plan. The question, however, will be whether they want to proceed with a straight repeal without a replacement, and then pass a replacement sometime later, because their simultaneous repeal-and-replace strategy did not fare well this time. But just repealing Obamacare with no replacement would be a perilous path because the insurance market of 2009 no longer exists. Would health insurance companies now reinstate some of the troublesome aspects of the pre-ACA marketplace, such as excluding people with pre-existing conditions and imposing lifetime caps on medical expenditures? There were reasons why many of the ACA’s changes were very popular with almost everyone, so going back to the pre-Obamacare health insurance marketplace is not very appealing, even temporarily, for most people. Is Obamacare “collapsing” or “exploding,” as critics suggest? It definitely has some major problems, but to some degree, those are problems of Congress’ own making. For example, Obamacare as enacted in 2010 recognized that there was the possibility that the people who would clamor for health insurance the most would be older and sicker than most Americans, generally speaking. So there would need to be some midcourse corrections or additional payments by the federal government to the insurance companies to mitigate the increased risk of adverse selection. These additional payments were called “risk corridors” and enabled insurance companies to accept all comers without turning away those they thought would be particularly costly. In 2014, Sen. Rubio and other Republicans characterized those payments as a “bailout” to insurance companies, and they declined to appropriate the funds when the bill came due, even though they were part of Obamacare’s original bargain with the insurance companies: Take everyone and we’ll make sure you don’t get buried by a particularly unfortunate risk pool. But once those risk corridor payments were not made, insurance companies started to raise premiums and annual deductibles, reduce the plans they offered, and pull out of certain markets entirely. So, yes, Obamacare is experiencing some serious contractions, but Congress could address those issues by reinstating the risk corridors that were part of Obamacare as it was originally enacted. There’s been a “Medicare-for-all” groundswell in some policy circles surrounding the health insurance debate. With the failure of the American Health Care Act of 2017, have we reached the tipping point for European-style national health insurance? You could argue that Obamacare is the last effort to make private health insurance work for everyone. But to fully implement its goal of wider coverage requires some things that a certain segment of the population regards as infringements on their liberty. If anything, what Obamacare shows is, if you want everyone to have health insurance, everybody needs to be in the risk pool, not just those who perceive an immediate need for health care services. Accordingly, you need an individual mandate along with a penalty with real teeth – not a watered-down version that lets people decide that paying the penalty is cheaper than buying health insurance. Otherwise, you’re not attracting enough people to the pool to spread the risk. Do Republicans push for tax reform now? Tax reform will not be an easy lift, especially now. First, the health care debate showed that neither House Speaker Paul Ryan nor President Trump can get their caucus together even on an objective that enjoys near-universal agreement. Once you got beyond the top-line message of “Repeal Obamacare,” there was no real cohesion in the Republican Party and no real momentum toward a deal. Second, there will now be no massive budgetary savings, on the order of more than a trillion dollars, from health care reform. What this means is that tax reform may still result in lower tax rates, but not in the dramatically lower rates promised during the campaign, or else the budget deficit explodes. Those foregone Medicaid savings will mean that lower tax rates will require closing more tax loopholes, all of which have their defenders. As a result, the corporate tax rate might decrease from 35 percent to 32 or 31 percent, which will not get anyone terribly excited nor ignite much of an economic boom. Apart from lining up with Obamacare’s enactment anniversary, there was a reason why Republicans went with health care reform first, and that was to provide budgetary savings to make tax reform worth the candle. That’s less likely now. On the other hand, there could be more buy-in from Democrats on tax reform, because Republicans will no longer be attacking a law associated with President Obama – and no one likes the current tax code.